UPDATED: Fri., April 12, 2019, 7:06 p.m. 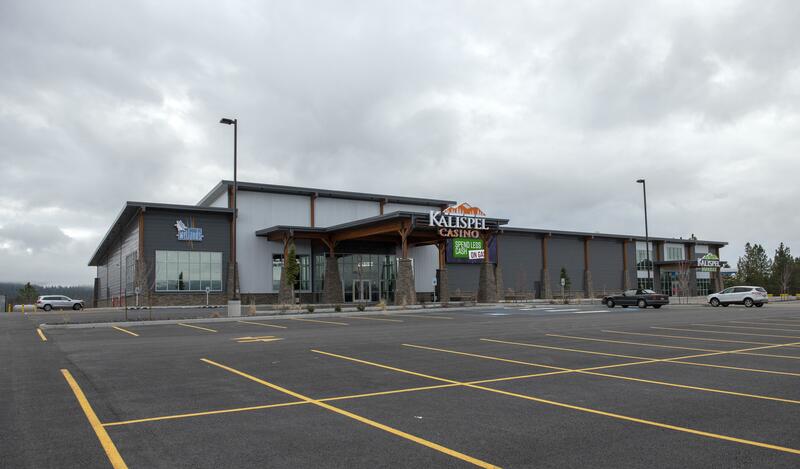 The Kalispel Tribe has opened a new casino in Cusick that is part of a more-than $10 million economic development project that also includes an RV park, storage facility, gas station and fresh market. The 20,000-square-foot Kalispel Casino at 420 Qlispe Way includes a gaming floor with 120 slot machines; a banquet room that seats 150 people; The Wetlands, a 72-seat family-friendly restaurant; and The Slough, a neighborhood-style bar with a shuffleboard, pool tables and a selection of craft beers and cocktails. The facility marked its grand opening Friday morning and people were already stopping in to eat at the restaurant and test their luck at the casino, said Curt Holmes, member of the Kalispel Tribe’s council and executive director of public and government affairs. Kalispel Casino is an integral part of the Tribe’s comprehensive economic development project, Kalispel Park, located a few miles west of the Kalispel Reservation off of state Highway 20. The project includes a Chevron fuel station, fresh market stocked with produce, dairy and meats as well as the Kalispel RV park, which is opening this summer. The park will have 33 RV hookups and eight cottages for short-term rentals – each named after a peak in the Selkirk Mountains. The development will also include a 20-unit storage facility with laundry and shower facilities. The tribe has spent several years creating and improving infrastructure at Kalispel Park to attract not only locals but people traveling on the International Selkirk Loop, a 280-mile scenic highway stretching through Washington, Idaho and British Columbia. The tribe is aiming for Kalispel Park amenities to be the main draw for visitors rather than the casino, Holmes said. The Kalispel Tribe also owns and operates Northern Quest Resort & Casino in Airway Heights, which opened in 2000. That facility underwent a large expansion last year to add a retail store, movie and dinner theater, and an RV park. Northern Quest’s expansion and the Kalispel Park development represent about $80 million in new investment. It has been a goal of the Kalispel Tribe to build businesses that contribute to the overall growth of the area, Holmes said. The tribe envisioned expanding its economic footprint in the Pend Oreille Valley beginning in the mid-1970s, when Kalispel Metal Products and the Kalispel Case Line opened for business. The Kalispel Career Training Center opened in 2011, followed by the Kalispel Rest Area in 2014 and Kalispel Auto Sales in 2017. The tribe, through revenue generated by Northern Quest, was able to build the 77,000-square-foot Camas Center for Community Wellness to improve the quality of life for tribal members and the community. The Kalispel Tribe employs more than 2,000 people in Spokane and Pend Oreille counties. The Kalispel Park development will employ 80 full- and part-time workers, including 40 casino employees. “It’s tremendous seeing locals have an opportunity for new jobs in a place that historically struggles – that’s what we feel good about,” Holmes said. Holmes said the tribe is conducting feasibility studies for a potential hotel and more amenities at Kalispel Park. “It’s so beautiful out here, and we are blessed with so many natural resources. People come up here to enjoy it, but there’s not a lot of lodging,” Holmes said. Published: April 11, 2019, midnight Updated: April 12, 2019, 7:06 p.m.